Bloomsbury USA Childrens, 9781619634756, 40pp. In this mischievously funny picture book, friends come in all shapes and sizes. Yes, that's right. Giraffes ruin everything. But what happens when our narrator gets into a tricky situation? Perhaps he'll find giraffes aren't so bad after all . . .
Heidi Schulz is the author of the middle grade novel Hook’s Revenge and its sequel Hook’s Revenge: The Pirate Code. 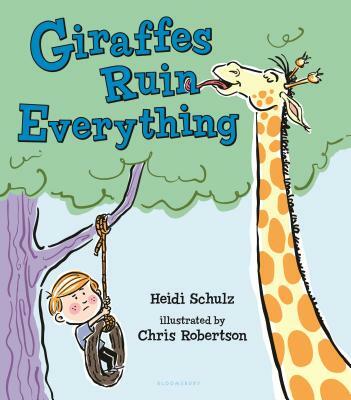 Giraffes Ruin Everything is Heidi's first picture book and was inspired by a run-in with a rude giraffe. She lives in Salem, Oregon, with her husband, their daughter, and several short-necked pets. Chris Robertson has worked as an illustrator for magazines and newspapers and as a storyboard director for Nickelodeon Animation Studios. He lives in Pasadena, California, with his wife and three boys.